“He’s on the lamb?” said my army-veteran cousin – half laughing, half shocked – after I shared a surprising tale about a distant cousin. We were having dinner earlier this week at a quaint eatery in the North End of Boston. My cousin’s sister was in town for a conference. The law enforcement reference was in response to a story I told about our parents’ cousin who had relocated to Australia in his early twenties. Everyone at the table had heard countless reverential stories about “David,” who would by now be in his early eighties. David had a wonderful joie de vivre. He grew up in farm country, up-state New York – close to godliness in our family. David laughed. At the “lamb” dinner another cousin’s wife told me a story, parts of which I had never heard before. She’s a few years younger than me, already a grandmother of two. Her mom passed away when she was 18, leaving her and her brother effectively alone. She pulled it all together to make things work – both for herself and her then 15-year-old brother. By her early twenties she had a GED and two children. Along the way she earned her associates degree and entered a management track in the airline industry. She is magnanimous and lovely. She loves her two adult children deeply. Her dreams are straightforward. She wants to enjoy her life. So much of her early adult life was unavailable to her. She is living now. Did you ever think guilt would accompany a transition? Sometimes guilt is clear: David should carry guilt with him on his journey down-under. My cousin’s wife’s story, her at-times tortuous path since 18, leaves me feeling a different kind of guilt. Have I worked hard enough given all that I’ve been able to access? Transition. Time. Am I making the most of it? Are you? David’s hasty departure from farm country reminded me of an analogy that I used over and over again when I ran EMaven, a VC-backed technology services firm. I can’t believe I didn’t think of it when writing Analogy: a powerful transition tool. It went something like the following…. “If you asked a farmer in the late 1800’s what he needed, he’d probably say a bigger horse. He could never conjure the concept of a tractor.” I used that analogy, usually with an apology for the gender reference, to help people understand that the introduction of something new could change one’s experience exponentially. The tractor with its productivity & production efficiencies is thought to be one of the greatest achievements of the twentieth century. Is the reference limited to only technology? Can the tractor be useful in thinking about transition too? I remember when I joined Iron Mountain I was struck by the demeanor of the Human Resources team. They were scared. Scared because of a historical inability to deliver. They had over-committed and under-delivered many times. I remember using a sports reference to help them understand this guilt ridden state. It went something like this, “the best in baseball have averages of .300. That means 7 out of 10 times at bat they strike out.” 7 out of 10. I think we need to keep this in mind during transition. To me — not a sports person — the numbers speak more to ‘getting up to bat’ than ‘performance.’ My team needed to get into the game — a good part of the rest would take care of itself. I think Herminia Ibarra had it right in Working Identity, “you need to craft experiments.” (Working Identity, pg 91-96) Experiments from Ibarra’s perspective allow us to re-frame the questions guiding our search. Guilt. It is an odd mixture — why do I feel guilty? Because I’m not working? I am working almost every day on a few new ideas that could be companies. No one is paying me for this now. So, am I contributing? I remember getting furiously angry at a male colleague at business school who honestly asked why “we ‘women’ had taken seats away from men who had to earn a living to support their families.” He was a Neanderthal. Probably still is. But am I wasting the degree? I’ve been given — or I worked hard for — so many amazing opportunities. How is it exactly that at 47 I can’t seem to prioritize a next step? Why does this cause me to feel guilty? As an aside, I feel guilty some days because I spend a fair amount of time blogging. Here is one way you could help me walk free of this mental state. I know you don’t like to comment. But, did you know that you can tell me if you like the post – anonymously? Here’s how. There is a little button that says LIKE THIS below the post. If you hit it, I’ll get a count of how many readers liked the post. No one will know if it was you who liked it – except you! My mother was in her mid-sixties when she learned the reason for her cousin’s abrupt departure to Australia. It seems there was a mysterious fire in the family home. No one was hurt. He departed almost immediately thereafter. Sometimes guilt accompanies transition — like perhaps David’s youthful failure — or my HR team’s near petrification under duress. I know too well that guilt can be like glue…immobilizing. Today, at least for part of the day, I am riding guilt-free; experimenting, trying, and being thankful for this incredible time. 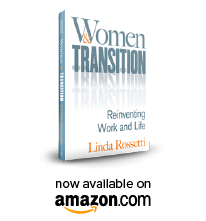 This entry was posted in Observations on Transition and tagged career transition, observations from a women's transition, women's transition issues. Bookmark the permalink.